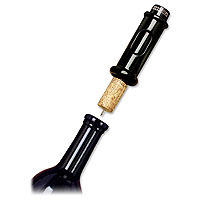 Cork Pops is a fast, easy & fun way to open a bottle of wine! Simply insert the needle straight down through the cork, press once on the top of the low pressure propellant cartridge, and the cork is lifted out with a celebratory "POP"! What could be easier? Each cartridge will open approximately 60-80 bottles before requiring a replacement.